There is a rise of a new trend these days among certain groups of tech enthusiasts. It wasn’t long ago that one of the most important things about getting a new tablet was whether the OS ran smoothly or not. We won’t be talking about the iPad in this article. Unlike Apple’s powerful tablet, the Android tablet industry is filled with fragmentation. Two people with similar but not identical tablets will have very different experiences based on the make. If you have an iPad air, out of the box it will be the same device as another iPad air. But Android, manufacturers have choice. The most important choice that manufacturers make is what SoC to employ. SoCs (System on a Chip) are basically the heart and soul of a product. The SoC essentially handles the operations for a mobile device. Unlike Desktops (or rather traditional desktops), the CPU and GPU aren’t separate – it is all under the SoC, including the wireless radio. So it’s a big decision for companies when they decide what SoC to go with. Some of the more popular SoCs and in competition with each other are the Snapdragon by Qualcomm, Tegra by Nvidia and Samsung’s Exynos. These all use an ARM architecture (let’s not get into the details of that) which is specifically for mobile platforms. Other SoCs are Atom by Intel, OMAP by Texas Instrument and of course the Ax SoCs by Apple used in their devices. Right now there is a heated competition between two SoCs. Qualcomm’s Snapdragon and Nvidia’s, and not just for the manufacturers either. More tech enthusiast consumers are looking into these things to make sure they are getting the most out of their well-spent money on their tablet of choice. A regular consumer could care less what powers their powerful portable computer, but say, someone who wants to use his tablet as a portable gaming device may be looking into it more deeply. 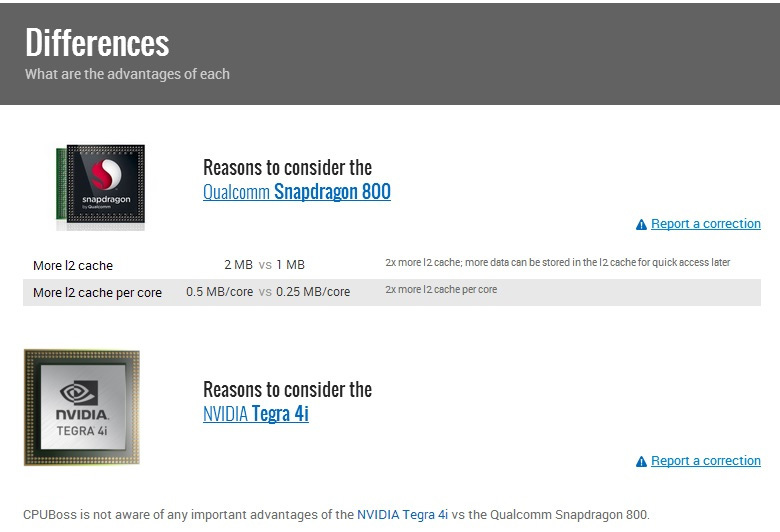 Using cpuboss, a website to compare between processors, these are the specs that came up between the two competitors. Currently the Snapdragon is ahead as far performance goes. It has more bang to its cores, so generally speaking users who want a more gaming oriented tablet would most likely be leaning towards the Snapdragon Tablets. If we are talking about Android of course. But Nvidia is looking to make a come back with its Tegra Ki SoC. It’s a constant race between the two evenly performing chipmakers and unlike the 32/64 bit processor market where Intel continues to dominate mostly, the position at the top for tablet computers is always changing.